A diamond's total carat weight is determined by the minimum weight of all the diamonds in a single piece of jewellery. For instance, if a pair of diamond studded earrings has a total carat weight of 1/2 (.50) carat, then each earring in this pair would have an individual carat weight of 1/4 (.25) carat. Even though the price of a diamond increases exponentially with the carat weight, the actual size does not. The table below illustrates the typical size relationship between diamonds of increasing carat weights. Note that when carat weight triples (from 1 to 3 carats), perceived size roughly triples as well, however the diameter increases only 45% (from 6.50 to 9.40), and crown area (the surface area visible when the diamond is set) slightly more than doubles. This is important to keep in mind when reviewing diamonds of any shape; a given increase in diameter will yield a larger increase in surface (crown) area and overall perceived size. 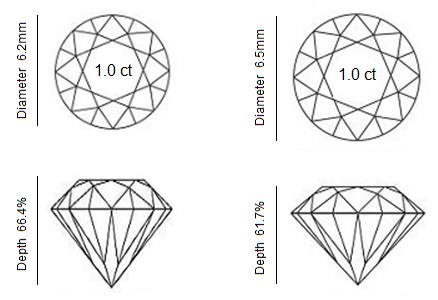 While the third diamond above has a roughly 50% greater diameter than the first, it certainly appears more than 50% larger, as shown in the diamond carat size chart below. Two 1 ct. Diamonds: The diamond on the left has a deep cut and appears smaller from above. Two diamonds of the same shape and carat weight may still appear different in size based on the cut proportions. A deeply cut diamond has a greater proportion of its total weight "hidden" in the depth, resulting in a smaller diameter than a well cut diamond. These differences are usually small, but noticable. A well cut diamond may even have a slightly lower carat weight than a deeply cut diamond, yet still have a larger diameter, making it appear larger in size. Two diamonds of equal carat weight may also appear very different in size based on the shape of the diamond. For instance, a 1 carat marquise tends to appear larger than a 1 carat round. As diamond's carat size increases, both the diameter and the depth of the diamond also increase. A 1 carat diamond approximately 6.5mm in diameter will not look twice as wide as a 1/2 carat diamond that is approximately 5mm in diameter. Our Diamond Carat Size guide below, demonstrates how diamonds of various carat weights appear when viewed from the top down. Since carat is a unit of weight, not all diamonds of equal carat weight will appear to be the same size due to their differing measurements. See the guide below for clarification on specific styles and carat weights. As the carat weight increases, so does the size of a diamond. However, confusingly, this relationship is not a linear but rather a curve - so a 2.0ct diamond will not appear twice as big as a 1.0ct diamond as shown below. Size Difference Between a 1ct and 2ct Diamond. When comparing similar diamonds try to look at the measurements. Some diamonds with similar weights can vary significantly in measurements. Pick the one with wider measurements, and you will gain a larger diamond surface area for the same value. Certain diamond sizes are highly sought after (e.g. 0.50ct, 0.75ct, 1.0ct) and prices can vary dramatically depending on the carat weight. A 0.90ct diamond can be 10-20% better value than a 1.0ct diamond of the same quality but can appear almost identical in size but very different in price. Once cut, color, and clarity grade have been determined, the carat weight of a diamond can be easily established to fit within a budget. Larger diamonds are much more valuable because they are discovered in nature much less frequently than small ones. Diamond prices actually rise exponentially with carat weight rather than linearly. For example, a 1.00 ct. diamond of a given quality is always valued higher than two 0.50 ct. diamonds of the same quality. In fact, a general rule of thumb is that a diamond of double the weight costs around four times more. "Under-sizes" are diamonds that weigh just below a cutoff weight. While fewer exist, they may represent an enhanced value. They are more difficult to find as a diamond cutter will choose to sacrifice beauty in order to cut a diamond with a weight that reaches one of the cutoff weights, or "magic numbers" as they are known in the industry. The cutoff weights are 0.50 ct., 0.75 ct., 0.90 ct., 1.00 ct., 1.50 ct., and 2.00 ct. The term carat originates from the Greek and Arabic names for the carob tree - Keration in Greek and Qirrat in Arabic. The dried seeds of the Carob (or Locust) tree were once widely used by trading merchants as counterweights for weighing gold, diamonds, gemstones and pearls due to their relatively consistent weight and size. It is important to note however, that the term "carat" with reference diamonds is different to "karat' which is the value used for the purity of gold. The Byzantine era used glass pebbles, based on carob seeds, for weighing coins, which weighed in at 196 mg, consistent with the average weight of an individual carob seed. However their use eventually diminished as it was discovered that despite their visual uniformity, the seeds were not actually consistent in weight. Many attempts were made to standardise the measurement of gemstone weight and it was only in 1907, at the Fourth General Conference on Weights and Measures that the "carat" was adopted as the official metric measurement for gemstone weights. In 1913 the United States officially accepted the 'carat' as the gemstone measurement, and in 1914 the United Kingdom and Europe followed suit. By the 1930s, the majority of the diamond and gemstone industry had agreed to the standardised measurement, which is still in use today. Dimensions play an important role in the appearance of a diamond. In addition to the carat weight, the distance across the top of the diamond must also be taken into consideration. A common misconception is that half a carat is half the size of one carat. In fact, a half carat is half the weight of one carat, but the millimetre difference on a round stone is only 1.35mm. The average measurement for a 0.50ct stone is 5.00mm, while the average 1.00ct stone measures at 6.35mm. See Diamond Carat Size guide above. While carat weight may indicate a diamond's size, the shape and cut of a stone also play a large part in determining how large or small the stone appears. An elongated shape such as the Marquise cut may appear larger than a rounded shape such as the round brilliant even if the two stones share the same weight.